Join Us on Event day! Jeff D’Onofrio is a digital media executive with deep experience in executive management, operations, strategy, and finance. Jeff’s career has spanned pioneering platforms in live streaming, social media, review content, advertising and commerce with Tumblr, Google, Zagat, and Major League Baseball Advanced Media. He has a tremendous track record of unlocking growth, profitability and value, including leading the sale of Zagat to Google and leading Tumblr’s user growth and engagement efforts. 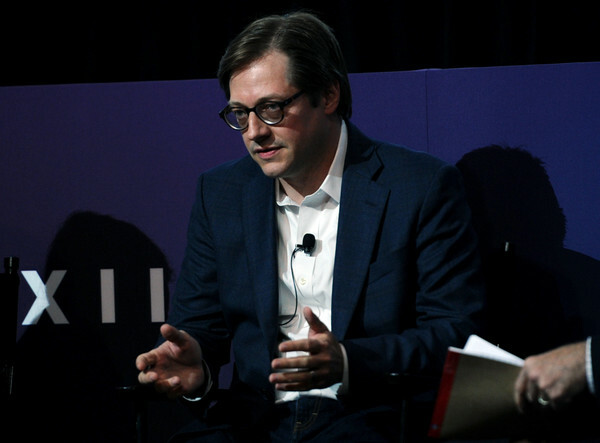 Jeff currently serves as Tumblr’s CEO and as General Manager of Yahoo News. Jeff received his Bachelor's degree in accounting from Penn State and his MBA from Cornell University. Doc Parghi is a venture capitalist with operational experience running and scaling businesses globally. Doc is a Partner with SRI Capital, an early stage venture capital firm. With over 30 investments, SRI Capital provides funding, advice and liquidity solutions to early stage start-ups primarily in enterprise software and deep tech. Previously, Doc was the Global GM of the Mobility, Social, and IoT business unit at CSC (now DXC Technology), with complete responsibility for building the business globally. DXC (NYSE: DXC) is a $20 Billion IT services and consulting company. Doc was on the founding team at AppLabs, the world’s largest independent software testing company with over 2,500 QA professionals in US, UK and India. He helped lead AppLabs through various transformations into what became the largest company of its kind. AppLabs was funded by Sequoia Capital. CSC acquired AppLabs, providing Sequoia with a sizeable return. Doc was involved with other early stage companies prior to AppLabs including iCoop (group purchasing dotcom). Doc received his BS and later his MBA from Drexel University. Doc is a member of the boards at Ben Franklin Technology Partners of Southeastern Pennsylvania and Bunker Labs. In addition, Doc is a co-Founder of Broad Street Angels and is a founding member of TiE-Philadelphia. Doc also serves as a Civilian Aide to Secretary (CASA) of the Army for Pennsylvania-East, appointed by the US Secretary of the Army. CASAs provide individual advice to the Secretary of the Army, the Chief of Staff, and commanders at all levels. Daniel Herscovici is a recognized leader in Smart Home, IOT, and digital transformation. Over the past 20 years he served in leadership roles at Fortune 50 companies like Comcast and Motorola and spent much of his career focused on creating new businesses within large enterprises. An entrepreneur at heart, he founded and led several new to market business lines focused on consumer tech and tech services. He has a passion for consumer centric design and is always looking for innovative ways to address unmet, unarticulated market needs. Daniel will spend time within the Edison’s enterprise solutions practice, both helping entrepreneurs build world-class companies and sourcing and leading investments. Given his extensive operating expertise and experience, he will spend considerable time in the IoT sector and with companies where small businesses and consumers are target markets. Daniel founded and led Xfinity Home, Comcast’s Home Security, Smart Home and IoT business unit. Most recently, Xfinity Home was recognized as the fastest growing home security business in the U.S. with more than 1.2 million subscribers. Prior to Xfinity Home, Daniel conceived and launched Xfinity Wi-Fi, which today provides 19 million Wi-Fi hotspots nationwide. In addition, he launched Signature Support, a premium outsourced IT services business line. He maintains four patents in mobile device mechanical design and is credited with accelerated methods for improving the in-home Wi-Fi experience. He gained his experience in successive leadership positions at Lucent Technologies and Motorola mobile devices. Dan leverages an exceptional technical product design background and operational leadership to commercialize and accelerate business success. Allison Williams is Director of NVP Labs, a “bridge-to-seed” accelerator program at Newark Venture Partners. NVP Labs invests in early-traction B2B businesses that have strategic alignment with NVP’s corporate LPs (Audible/Amazon, Prudential, Dun & Bradstreet, Panasonic, RWJBarnabas and others). Before moving to venture, Allison became a seasoned leader with CEO and COO experience and a proven track record of driving expansive growth in startup technology companies. As founder and CEO at Yarly, in two and a half years, Allison assembled a talented technical team, built a cross platform mobile application, established a nationwide distributed salesforce and achieved profitability. In mid-2015, Yarly was acquired by YesVideo, a top competitor which powers over 30,000 retail locations, and Allison was retained as an advisor. Since then, Allison has been COO of a multi-national influencer brokerage software company (top clients include L’Oreal and Heineken) as well as Head of Strategy for a leader in the live streaming video space (top clients include Univision and Monumental Sports). Allison is a graduate of the University of Pennsylvania Wharton School and Columbia Business School. A Norwegian native, Arne [‘arni] joined the FJ Labs team in the spring of 2016. He lived in San Francisco for 1.5 years, where he was director of global partnerships for Telenor and focused on business development with Google [x]. Andrew founded Big Idea Ventures and is responsible for investing and building companies in the alternative protein and plant based sectors. Andrew has invested in more early stage / pre-seed food companies than most other investor worldwide. Andrew is focused on innovation, developing high-growth businesses opportunities and as a business advisor in multiple verticals. Andrew serves on the Tufts Nutrition Council advisory board, is a Friedman School Entrepreneurship Advisor. A Harvard Business School graduate and Procter & Gamble brand management trained.